The Archdiocese of Dubuque will celebrate its annual chrism Mass on April 16 at 2 p.m. at the Cathedral of St. Raphael in Dubuque. 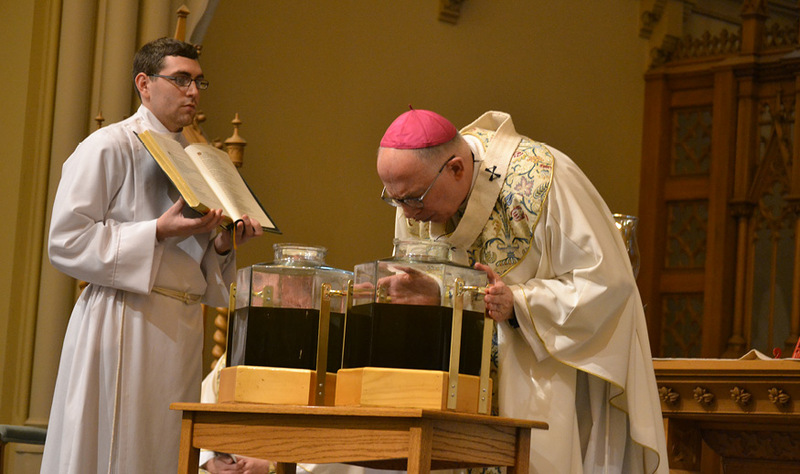 Priests, deacons, lay ministers and other parishioners from around the archdiocese will gather with Archbishop Michael Jackels as he blesses the holy oils that will be used for the sacraments and rites of the church in the year ahead. The chrism Mass is traditionally celebrated on Holy Thursday morning, but it is a liturgy that can be transferred to another day. Due to the great distance many participants must travel in order to attend, the chrism Mass is held every year on the Tuesday of Holy Week in the Archdiocese of Dubuque. Archbishop Jackels concelebrates the chrism Mass each year with the priests of the archdiocese as a way of demonstrating the communion of the priests with the archbishop. During this special liturgy, the priests recommit to their office by renewing the promises they made on the day of their ordination to the priesthood. Father Digmann, who will travel about three hours from Ames to reach the cathedral in Dubuque for this year’s chrism Mass, said he appreciates that the liturgy brings together all his brother priests from every corner of the archdiocese to share in a day of priestly fraternity. Klaus said she expects the prayers and music and sacred atmosphere that surround the chrism Mass to have a significant impact on her. “This will be an emotionally and spiritually moving experience,” she predicted. 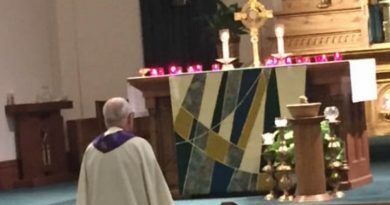 As the people of the archdiocese gather together from their respective parishes for the chrism Mass each year, Klaus said she sees in the tradition an expression of the church’s unity despite its diversity. One of the central parts of the chrism Mass each year is the blessing of the oils. The oils include the oil of the sick, which is used in the sacrament of the anointing of the sick; the oil of catechumens, which is used on those preparing to be baptized; and the sacred chrism, which is consecrated and used in the sacraments of baptism, confirmation and holy orders. 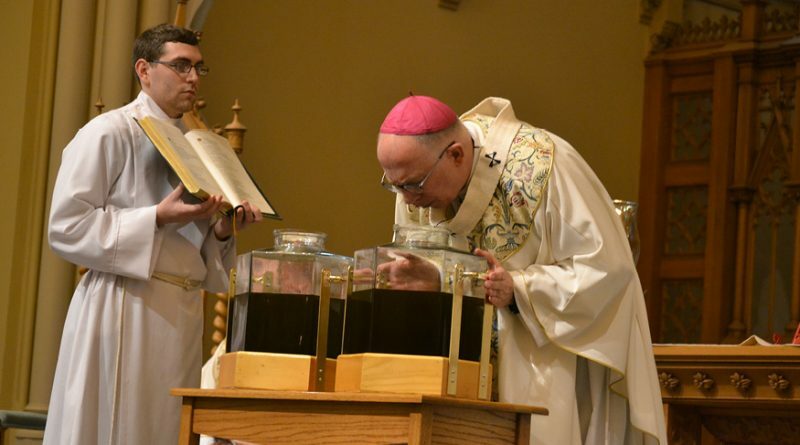 “There is a long tradition of using oil in religious ceremonies, and I find it meaningful that oils continue to be important in our church today,” Klaus said. In the Archdiocese of Dubuque, after the archbishop has blessed the vessels of holy oils during chrism Mass, they are carried to St. Raphael’s cathedral center, located in an area behind the worship space of the cathedral. As Mass continues to be celebrated in the church, volunteers in the cathedral center pump the oils into small containers that will be distributed to representatives of every parish in the archdiocese and taken with them for sacramental celebrations in their parish communities. 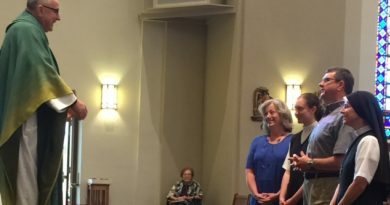 Father Digmann said he will be responsible for bringing the blessed oils back to St. Thomas Aquinas Parish in Ames after this year’s chrism Mass. 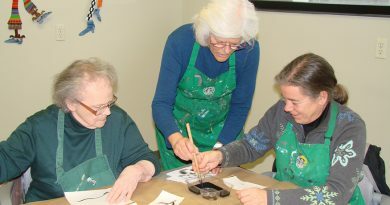 One of the many volunteers who has agreed to assist with this year’s chrism Mass is Angella Link, who will be among those transferring the blessed oils into the small containers that parish representatives like Father Digmann will be taking back with them to their parishes after the chrism Mass is over. Link is a member of St. Joseph Parish in Key West and a counselor for Catholic Charities of the Archdiocese of Dubuque. She is also the mother of a seminarian; her son, Joshua, will be ordained a priest for the Archdiocese of Dubuque in May. His impending ordination gave Link extra incentive to volunteer at this year’s chrism liturgy. This year’s chrism Mass will be livestreamed on the archdiocesan website. Visit dbqarch.org/live for more information. 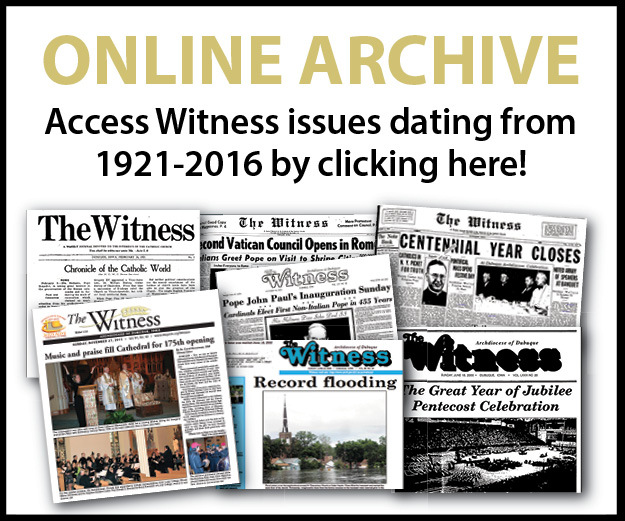 Photos and other coverage of the event will be in the April 21 issue of The Witness and at thewitnessonline.org. ← The Master has need of us!